I was quite nervous for today – it was my first day of class! I didn’t know what to expect or how it would be. Would I feel strange? Would I be an outsider among my own people? Would I be accepted? Would people be able to tell that I have lived 14 years in the United States? Or would I just blend in like everybody else? All these questions lingered my head as I arrived at the building where my first class would be held. I was nervous and scared at the same time, there was no one inside the classroom. The class was scheduled to start at 2:00 pm and it was 1:55 pm, I was expecting to be the last one. On the contrary I was early and the classroom was empty…. I asked a student outside of the classroom if she had the same class, and she answered yes. She said that it was quite normal for professors to show up 15, 30, 50 minutes late – even an hour, or maybe not even show up at all. For her last class the professor had come an hour and 20 minutes late to the class. I was told that that would not be uncommon but it it just a hard concept to grasp even though I was already told it could happen. This occasion was not the case, I decided to wait inside the classroom. The teacher arrived at precisely 2:00 pm and started going over a concise syllabus. The syllabus did not have due dates and was not divided by days, but it had the class objectives, grading scale, purpose, content and materials needed for the class. I felt comfortable inside the classroom and was relieved that it was not as overwhelming as I thought. Most of the students already knew each other because they were all majoring in the same field. I, on the other hand, was the only one taking the class as a requirement for a liberal arts college. I see that as an advantage because I can meet people at the university with all kinds of backgrounds and interests, not just one area or field. The class was dismissed after 30 minutes and I walked with a girl named Alejandra to the “peceros” (Bus type vans) in-front of the school. After that I took another pecero home and ate with my host family. 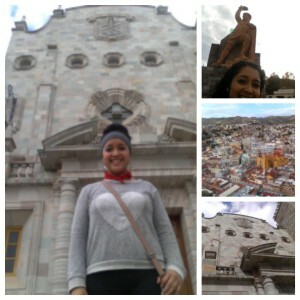 That was my first day at the University of Guanajuato! Hopefully in the future I will be able to make close friends and feel more at home in the city of Guanajuato, especially at the university. Next Next post: Taking Gabs by Africa Time!